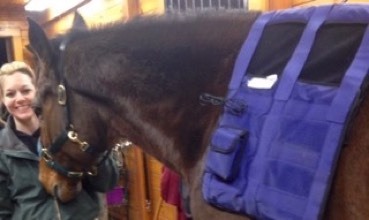 We are very pleased to offer FAR infrared heat therapy for your horse. Infrared waves are divided into three groupings; near, middle and far depending on the actual wavelength measurement and can result in forms of light (near) or heat (far) that are easily absorbed by the body for healing and restorative benefit. Studies have shown that FAR wavelengths can penetrate up to 1.5 inches beneath the skin, significantly deeper than a basic “ heating pad.” FAR infrared energy can be used to address muscle and joint discomfort, reduce inflammation and decrease muscle stiffness. The horses generally find it comforting and relaxing. The FAR heat therapy can increase blood circulation as well as metabolic activity within cells; this delivers increased nutrients and oxygen to an attended area while removing amassed wastes and toxins. We now have these FAR heat therapy pads available which may be integrated into your horse’s massage, acupressure or integrated session. 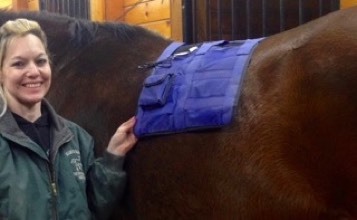 The pads are placed on various parts of your horses’s body during the bodywork. FAR Infrared Heat Therapy may be helpful for conditions such as neck pain, back pain and overall muscular tension. 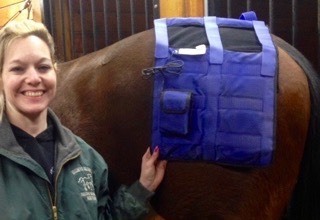 If you would like this therapy added on to your horse’s session, please notify us & we will gladly do so. Please see our Rates page for more information.